I just had to share this clip of Jeremy Renner (of The Hurt Locker) singing and playing piano on The View. Multi-talented to say the least. And he just makes me so happy … 🙂 Enjoy! Okay, so two confessions. I did not see The Hurt Locker in 2009. I saw it last week. But it did come out in 2009 … soooo … that’s something. Second, I was supposed to wait to watch it with Jess and Jess. I didn’t. Whew! Now I feel better, getting that off my chest. So … moving forward. 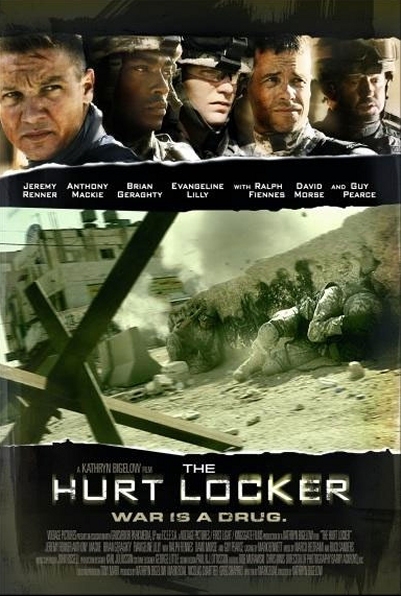 If you haven’t heard about The Hurt Locker, then you’re probably not watching any of the awards shows this season. Nominated for best picture in almost every big awards show this year (my bet is that it’ll be nominated for an Oscar tomorrow, too! ), this film tells the story of a team of soldiers whose job it is to defuse bombs in Iraq. Right away, we meet the three-man team trying to defuse an IED, but the mission ends tragically when the leader is killed by the explosion. Now Sgt. Sanborn and Specialist Eldridge are assigned a new leader–Sgt. James, played by Jeremy Renner (loved him in SWAT and The Unusuals). James is a loose cannon, adrenaline junkie. He doesn’t abide by the rules set up to protect their bomb squad, which drives Sanborn crazy. And Eldridge isn’t sure what to think. He feels responsible for the death of their former leader. Strong personalities collide in a city where every turn of the corner could mean the death. Tempers crackle and even in their down-time the men can’t help but let their emotions get involved. Pressure rises as the men count down their last 60 days in Bravo Company, and James risks everything for the rush of excitement. So what makes this movie different than other war movies I’ve seen? I think it’s hard to say. If I had to give it just one word, I might say heart. Somehow director Kathryn Bigelow has given this film such raw emotion that I couldn’t tear my eyes from the screen. I loved the characters–even when they did really stupid things. Even when I wanted to hate them. At the center of this story is a man who wants to earn the respect of his team, even as he refuses to do it their way. He wants to save lives and make bombs harmless. And he cares for the men in his team and the little Iraqi boy who sells him dvds, but that often conflicts with his own innate need for the emotional rush that comes with working with bombs. Defusing bombs is the only thing he really loves, or so James tells himself, but I think it’s really what he thinks gives his life worth. I think he’s wrong, but I see where he’s coming from. It’s not a stark story so much as it is a beautiful story of internal conflict told against the stark backdrop of a war-torn country and a war-torn man. Renner is absolutely brilliant, and so deserves the Oscar for this role. And the film is totally worth watching–with a couple caveats. The language is pretty foul, as you’d likely expect from a war movie, and there is definitely some violence. But it’s not gratuitous like some war movies. The blood is actually pretty minimal, given the situation. It’s not for kids. But the story is pretty incredible. Catch it before the Oscars in March. It’s worth it!